Holidays are a time to pause, a time to gather. I love to enjoy as much time as possible with my family and friends during this magical time of year. Advent dinners on Sunday nights, Christmas Eve, Christmas Day, give me any excuse all month long to be festive and fun. A tree adorned with lights, ribbons and ornaments, wreathes on doors, and garland on staircases create a sense of nostalgia and transform a home for this winter holiday. 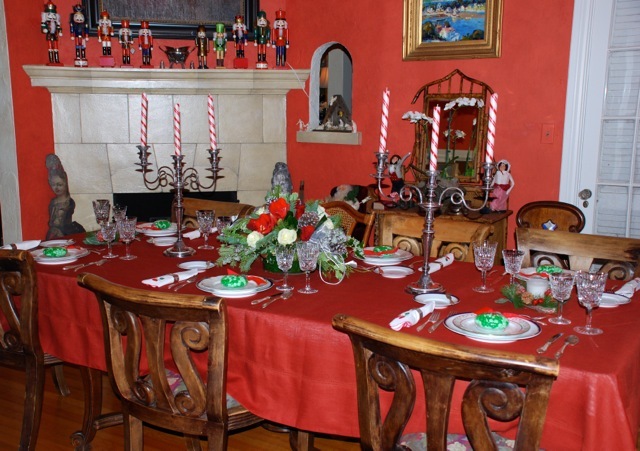 When everyone gathers in the dining room, table decorations can set the stage for a delightful evening. Colorful linens and fresh flowers infuse holiday cheer, while candles add to the ambiance, especially when they reflect the spirit of the holiday like these candy canes do. Add chocolate, wine, champagne and your favorite dishes, then just sit back and enjoy. Happy Holidays from Lisa Erdmann & Associates!